I wan't sure if Basil would be letting me be posting here since he's nearly 'bout quit doing the postings hisself. But my accounta aint'd locked, so I'm still around it seems. I was heading out to visit this lady I know, and I wanted to stop for pizza. They got a Little Ceasers pizza place out towards where this lady lives. So, I stopped by. Turns out they weren't open yet. Or something. But the Subway next door was open. So I ordered me one of those sandwishes. I was thinking about doing that Jaret diet, so this seemed like a good time to start. Now, if eating a 6-inch sub was good on a diet, I figuired I'd lose twice as much if I ordered a 12-inch samwich. And, since I want to lose weight even faster, I ordered two. But I noticed something about one of the other stores in the shopping center. 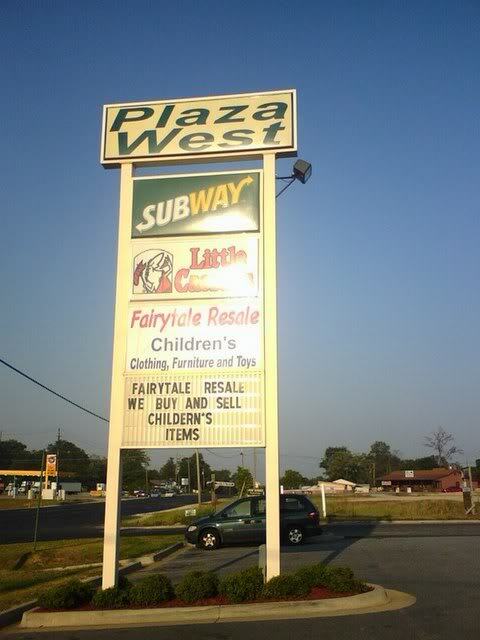 It has a place where they sells kids stuff. Now, since this lady has got some kids ... none of them mine. I don't think. anywasy, she has some kids. There's Joey Jr, Donnie Jr, and John Jr, and Bertram Jr, and Little Julio, and Jack Jr, and Demarqus Jr, and Lee Ping Jr, and Running Bear Jr, and Joey III. So, she's always on the lookout for stuff to by for her childern. Now, these little ones can be fun some times. But they can get in the way some times, too. Still, bless there hearts, they's good kids. So I'm trying to help out by finding places where she can buy stuff for them cheap. So, I seen this place that sells used childerns clothes. But I noticed something. Look close at the sign. They spells it "Children's" in one place, and "childern's" in another. 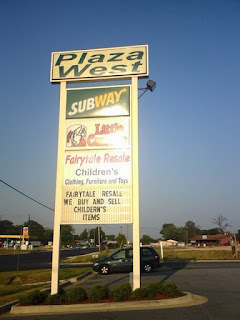 I'm thinking about calling them and telling them that they need to fix the sign. I just aint' sure which one to have them fix. Dang it! All them childern probly had her so micksed up she fergot how to spel it.